So my BIRTHDAY is coming up next week!! ...and I'd like to giveaway 6 yards of one of my fave Ankara fabric and another beautiful fabric, donated by Bae :D, to TWO of my Instagram followers. Winners will be announced on "Ye Day", 12/20!! 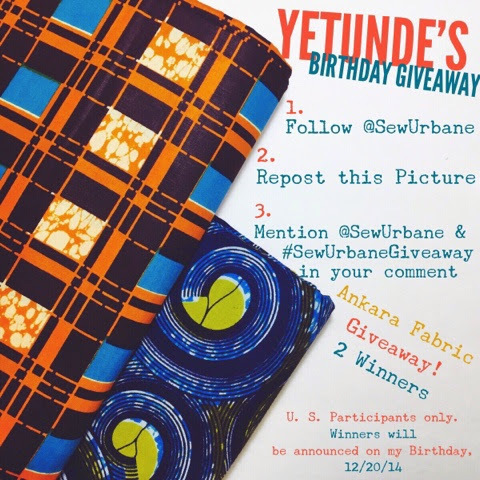 Follow me on Instagram, @SewUrbane, to participate! Happy early Birthday. We share the same birthday date. Nice fabrics you're giving away. Ayee, We're like birthday twins. lol Happy Early Birthday, Kelly!! Thank you!! !